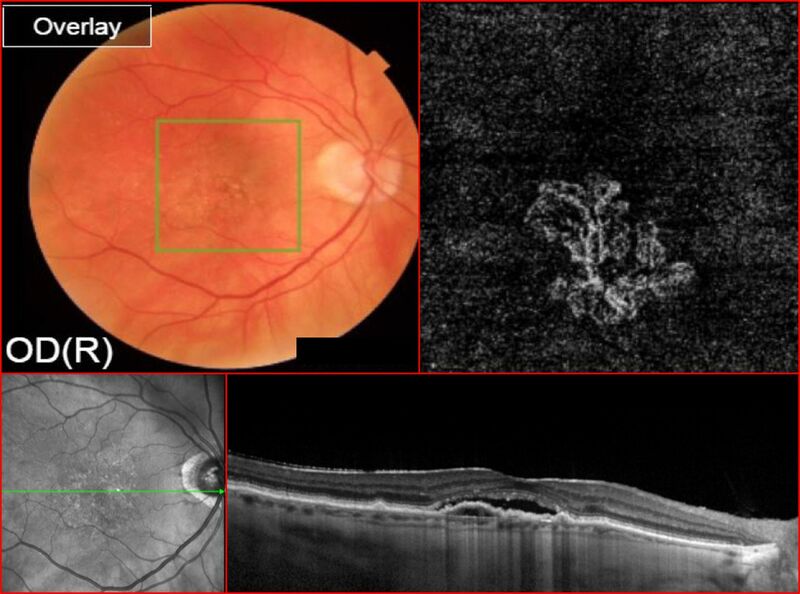 Aims To evaluate on optical coherence tomography angiography (OCT-A), the predictive role of different qualitative findings of choroidal neovascularisations (CNV) in assessing the status of exudative age-related macular degeneration (eAMD) and to develop a potential model to predict the CNV activity. Methods Retrospective review of the multimodal imaging records of patients with eAMD obtained during treatment for type 1 or type 2 CNV. The qualitative analysis of CNVs on OCT angiograms assessed the presence or absence of tiny branching vessels, loops, peripheral anastomotic arcades and choriocapillaris hypointense halo. These findings were then correlated with those of structural OCT scans. A score forecast was built and validated. Results One hundred and twenty-six eAMD eyes were enrolled in the study. Exudation was observed in 90 eyes (71%) on structural OCT. The qualitative OCT-A analysis revealed: tiny branching vessels in 82.5% of the cases, vascular loops in 81.7%, peripheral anastomotic arcades in 66.7% and choriocapillaris hypointense halo in 54.8%. In the univariate analysis, each OCT-A parameter showed a statistically significant correlation with exudation on structural OCT (p<0.001). The overall analysis demonstrated a sensitivity of 96.7% and a positive predictive value of 87.9%. In the multivariate analysis, a model with four criteria predicted an exudative lesion in 97.6% of cases and one with two criteria (tiny branching vessels and peripheral anastomotic arcades) in 71.2%. Conclusions The presence of tiny branching vessels and a peripheral anastomotic arcade appears to predict the lesion activity with a good accuracy and the model based on four criteria enables optimal decisions regarding retreatment in eAMD. Previous reports have suggested that OCT-A detects CNVs with the same sensitivity as FA.10 11 Moreover, the correspondences between different CNV patterns and the status of neovascular lesions have also been evaluated. However, to the best of our knowledge, no previous studies have addressed the decision efficacy of treating eAMD based solely on OCT-A findings. The aim of this study was to evaluate the predictive role of different OCT-A qualitative findings in assessing the status of CNVs and to develop a potential predictive scheme based on these morphological features. Retrospective cross-sectional review of the medical records of consecutive patients observed at the Centre Ophtalmologique de l’Odeon between January 2017 and April 2017. This study was conducted in accordance with the tenets of the Declaration of Helsinki and French legislation. Eligible patients had to meet the following parameters: (1) diagnosis of eAMD through multimodal imaging (FA, ICGA and structural OCT); (2) type 1 or type 2 CNV12; and (3) at least one intravitreal anti-VEGF injection (IVI) within the last 3 months and a minimum interval of 1 month between the last IVI and the OCT-A examination. Patients with CNV fibrotic scarring, type 3 CNV, polypoidal choroidal vasculopathy, retinal vascular or inflammatory diseases complicated with CNV or poor-quality images on OCT-A (signal strength index lower than 80) were excluded. A macular volume scan (49 B-scans within a 30°×20° area) centred on the fovea was acquired with a spectral domain OCT (Spectralis OCT2, Heidelberg Engineering, Heidelberg, Germany).14 OCT-A was obtained with a swept-source OCT device (Triton SS-OCT, Topcon, Tokyo, Japan) on a scanning area of 4.5×4.5 mm and an automatically segmented slab of 30 µm (shaped on RPE profile) was set immediately above the RPE and then moved towards the Bruch’s membrane in order to detect flow signals due to CNVs.11 A manual correction of the segmented boundaries was performed in a limited number of acquired OCT angiograms (less than 5%), especially in case of severe outer retinal/RPE disruption. This process was done by a senior retina specialist (FC), before the OCT-A qualitative grading, in case of incorrect RPE automatic delineation and was performed on structural, cross-sectional OCT scans. All the patients underwent a comprehensive eye examination including best corrected visual acuity (BCVA) using the ETDRS visual chart, retinal photography of the fundus, structural OCT and OCT-A. The patients’ baseline characteristics included age, gender, follow-up duration and number of previous IVI of anti-VEGF agents. The evaluation of OCT angiograms was performed in order to delineate the morphological qualitative features of a CNV. We considered four OCT-A criteria11 to qualitatively describe a neovascular lesion: (1) presence of tiny branching vessels (thin, tangled capillaries) versus mature vessels (defined as voluminous linear filamentous capillaries); (2) presence of an anastomotic arcade (peripheral connection between tiny branching vessels); (3) presence of loops (inner anastomoses between tiny vessels); and (4) presence of perilesional hypointense halo (the hypointense area is considered as a region of choriocapillaris alteration, corresponding to local flow impairment). Criteria were graded in a binary method (1 for presence and 0 for absence). All structural OCT and OCT-A images were separately evaluated 1 month apart from each other by two masked experienced ophthalmologists (FC and CF). Their evaluation aimed to accurately determine the morphological features of a CNV on OCT angiograms and the presence of exudation on structural OCT (figures 1 and 2). This process was useful in evaluating the intergrader reproducibility. All images were analysed independently in a separate sitting to evaluate intragrader reproducibility. The same evaluation was then carried out by a third observer (RS), from a different ophthalmological centre, on a validation sample from a different group of patients but with the same inclusion and exclusion criteria. Multimodal imaging of a 75-year-old patient suffering from neovascular age-related macular degeneration and followed up for 15 months. The visual acuity after nine anti-vascular endothelial growth factor (VEGF) intravitreal injections was 32 ETDRS letters. Colour fundus photo (top left) shows the area examined on optical coherence tomography (OCT) angiography (green square). The ‘en-face’ OCT angiogram (top right), segmented at the level of the pigmented epithelium detachment, shows type 1 choroidal neovascularisation (CNV) with a well-visible peripheral anastomotic arcade. There is no space between all inner branching capillaries. This CNV shows some features that are generally associated with an active (exudative) lesion such as tiny branching vessels and peripheral arcade. The cross-sectional OCT of the same eye does not show any sign of fluid accumulation (bottom). Multimodal imaging of an 80-year-old patient suffering from neovascular age-related macular degeneration and followed up for 18 months. The visual acuity after 12 anti-vascular endothelial growth factor (VEGF) intravitreal injections was 27 ETDRS letters. 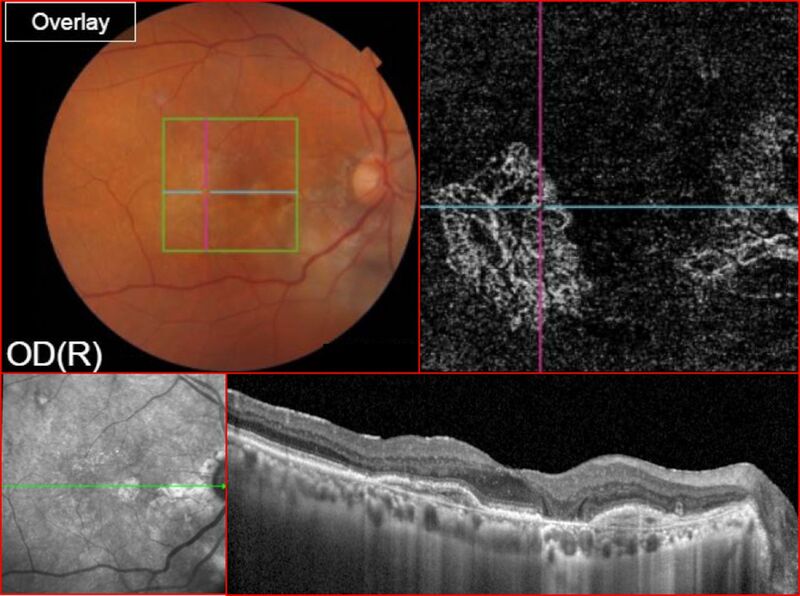 Colour fundus photo (top left) shows the area examined on optical coherence tomography (OCT) angiography (green square). The ‘en-face’ OCT angiogram (top right), segmented at the level of the pigmented epithelium detachment, shows type 1 choroidal neovascularisation (CNV) with a well-visible network of tiny branching vessels and loops. There is no space between all inner branching capillaries. This CNV shows some features that are generally associated with an active (exudative) lesion such as tiny branching vessels. The cross-sectional OCT of the same eye shows subretinal fluid accumulation (bottom). Descriptive statistics (mean±SD or frequencies and percentages) were used to analyse all variables. For qualitative variables, intragrader and intergrader kappa coefficients were accessed by using the χ2 test on a contingency table. Agreement between masked observers was assessed using the kappa statistic. A learning sample was used to develop a model that describes the relation between the qualitative variables and the variable answer and a validation sample to test the developed statistical model with another observer and different patients. The outcome assessment consisted of the decision to retreat with IVI after structural OCT evaluation. The statistical analysis included an investigation of association between the variable of interest and the potential predictors (univariate analysis). Principal component analysis with logistic regression analysis was performed to predict the effect of the four variables on a binary response variable. A set of p uncorrelated factors and normalised coefficients was built with values of correlation between the explanatory variable (OCT-A criteria) and the variable answer (retreatment decision), to minimise the bias related to their multicollinearity. The relative risk for each OCT-A criterion was calculated. Receiver operating characteristic (ROC) analysis of the predictive model was issued. A p value <0.05 was considered statistically significant. All demographic, clinical and structural OCT/OCT-A measurements were tabulated in Microsoft Excel 2013 software from Microsoft. All statistics were performed through XLSAT 2017 (Data Analysis and Statistical Solution for Microsoft Excel, V.2017.3). One-hundred and twenty-six eyes of 126 consecutive patients with exudative eAMD were enrolled in the current study. All subjects were Caucasian (97 females, 77%) with a mean age of 79.5±8.9 years. Baseline demographical and clinical characteristics are summarised in table 1. Fluid was identified in 101 eyes (80%). Mean CMT was 319.6±112.5 µm. The decision to treat and mean CMT were positively correlated in a statistically significant manner (p<0.002). In OCT-A image analysis, the occurrence of the four different parameters was distributed as follows: tiny branching vessels in 82.5% (104 eyes), vascular loops in 81.7% (103 eyes), a peripheral anastomotic arcade in 66.7% (84 eyes) and a hypointense choriocapillaris halo in 54.8% (69 eyes). The intragrader kappa coefficient was 88.5% and the intergrader kappa coefficient was 78%. The concordance rate on the validation test from the third grader (RS) on 104 similar records of retreated CNV was 90.9%. In the univariate analysis, there was a weak association between IVI number and the presence of a peripheral arcade (r=0.171, p=0.04) and an absence of an association between IVI number and tiny branching vessels (p=0.071), vascular loops (p=0.22) or a hypointense choriocapillaris halo (p=0.064). All the four different OCT-A criteria showed a statistically significant (p<0.0001) correlation with an active lesion on structural OCT. Sensitivity, specificity and positive and negative predictive values were independently assessed for each qualitative parameter. False positive and false negative rates were also independently assessed for all qualitative parameters (table 2). In the overall analysis, considering all four OCT-A criteria, sensitivity was 96.7% and specificity was 66.7%. The false positive and negative rates were 33.3% and 3.3%, respectively. Considering the 71.4% prevalence of eAMD in our study, the positive predictive value was 87.9%, and the negative predictive value was 88.9%. On multivariate analysis, the combination of all the four OCT-A criteria predicted the exudative status of the CNV lesion in 97.6% of cases. The ROC curve of a model including the four initial variables (OCT-A criteria) predicts the status of the lesion in 94.4% (figure 3). The cluster of tiny branching network and the peripheral arcade on OCT-A predicted a positive outcome (exudative status of the CNV) for two OCT-A criteria (tiny branching and peripheral arcade) in 71.23% of cases. 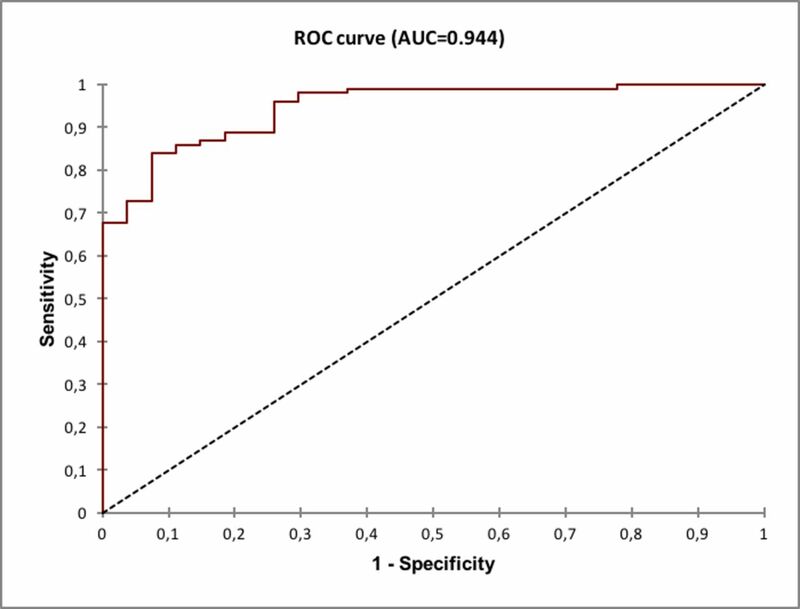 The receiver operating characteristic (ROC) curve between sensitivity and specificity showed that the current model, based on optical coherence tomography angiography findings, correctly predicts the active status of a choroidal neovascularisation (AUC, area under the curve) with a high probability for a therapeutic decision in each patient. The principal component analysis demonstrated the strength of the link between the explanatory variable (OCT-A criteria) and the variable answer (exudative status of the CNV and the consequential decision of treatment) for peripheral arcade, loops, tiny branching vessels and hypointense halo with a relative risk of 2.41, 2.96, 6.76 and 1.73, respectively (table 3). The probability of IVI treatment based on the presence of all four OCT-A criteria on OCT-A was 97.6%. The criterion ‘tiny branching vessels’ had the best correlation value with treatment decision and the highest relative risk. The criterion ‘halo’ had a non-statistically significant link with the decision of treatment and a low relative risk. In clinical activity, it is common practice to cluster criteria in pairs to easily summarise morphological changes. According to our analysis, tiny branching vessels and the peripheral arcade are the OCT-A criteria with the highest relative risk of exudative signs on structural OCT. Using a model with normalised coefficients, we demonstrated that the probability of IVI treatment considering tiny branching vessels and the peripheral arcade on OCT-A is 71.23%, which is inferior to a model containing the four criteria. These two criteria were also suggested as important biomarkers by Al-Sheikh et al 16 in a study of 31 eyes including 11 eyes with active lesions and 20 eyes with quiescent lesions. Tiny branching vessels were present in 82% of active lesions but in only 30% of quiescent ones (p<0.05). The peripheral arcade was also present in 82% of the active lesions compared with only 40% of the quiescent ones. This huge difference was not statistically significant probably due to the small sample size and consequent lack of adequate power. Nevertheless, these criteria may be considered as potential biomarkers of CNV activity. Every imaging modality suffers from some limitations. We observed some false negative patients on OCT-A. These cases corresponded mainly to patients with pigment epithelium detachment (PED) or haemorrhage with potential difficulties in imaging the CNV due to attenuation or blockage of the signal. Several previous studies, using different devices and different decorrelation algorithms (spectral domain or swept-source OCT), reported that the sensitivity of OCT-A in detecting choroidal neovascular lesions ranged from 50% to 87%.7 9 20 In a recent prospective study of 182 eyes, Eandi et al demonstrated a good agreement (r=0.84) between ICGA and OCT-A for CNV size, with a higher percentage of well-defined lesion borders detected by OCT-A.21 However, the agreement between these techniques was only moderate for the definition of CNV borders (kappa=0.4).21 We used two masked experienced readers and a validation test to minimise any resulting bias: as a result the intergrader correlation coefficient was very good. The study patient population includes only patients who were previously treated with anti-VEGF agents. However, according to previous studies, there is only subtle change after anti-VEGF treatment and, in case of recurrence, the CNV lesion regains its original morphology.17 20 22 23 Large prominent vessels in fact are not affected by anti-VEGF treatment whereas the tiny vessels are attenuated and pruned. Potential limitations of the current study are its retrospective nature and the relatively high prevalence of patients with an active lesion in which OCT-A criteria were tested. We acknowledge that treatment-naïve eyes or quiescent lesions were not enrolled. Further studies including a larger proportion of treatment-naïve and quiescent CNVs might be performed in order to validate the negative predictive value of our study criteria. Moreover, current results are based on qualitative criteria assessed by OCT-A while quantitative methods could be more reliable. The qualitative OCT-A analysis has its own limitations characteristic of all binary qualitative systems; for example, even if two networks have the same qualitative evaluation, they may have different degrees of activity that might impact the treatment decision and follow-up. Therefore, quantification of the extent of neovascular networks is a task of major importance,15 although quantitative representations of neovascular networks are often subjective and rely on manual delineation.20 24 Proven methods for automated detection and quantification of CNV are lacking, mostly due to projection and foreground imaging artefacts.25 Future research may shed some light on the quantification of the size, density and complexity of neovascular networks and their correlation with the decision to treat and response to treatment. In conclusion, OCT-A appears to be a useful technique in guiding the decision to treat and following up patients with eAMD, and that could be routinely used in clinical practice. A qualitative assessment of the CNV, based on OCT-A criteria, may substantially increase the capability to detect early recurrences, leading to a proactive therapeutic strategy, and providing the clinician additional parameters to establish treatment decisions and monitoring in eAMD.
. Age-related macular degeneration is the leading cause of blindness…. JAMA 2004;291:1900–1.
. Indocyanine green angiography and optical coherence tomography angiography of choroidal neovascularization in age-related macular degeneration. Invest Opthalmol Vis Sci 2017;58:3690. FC and ML are joint first authors. FC and ML contributed equally. Contributors FC and ML provided a substantial contribution to the conception of the work, to the acquisition, analysis and interpretation of data, in drafting the manuscript and in giving the final approval of the submitted study. FC and ML equally contributed to the manuscript and may be both considered as firs author. JFB, AS, DC, RS and CF contributed to the acquisition, analysis and interpretation of data and gave the final approval of the submitted study. EHS and GC provided a substantial contribution in the conception of the work, in drafting the manuscript and gave the final approval of the submitted study. Ethics approval Paris Institutional Ethics Committees (IEC).